The Throttle Position Sensor (TPS) is a variable resistor that changes value based on throttle movement. The control module uses information from this sensor to adjust fuel delivery to compensate for throttle opening. Vehicles equipped with electronically shifted transmissions use information from the TPS to control transmission shifting as well. Reference voltage is supplied to the TPS by the control module and changed by an internal variable resistor to output a signal relative to throttle position. 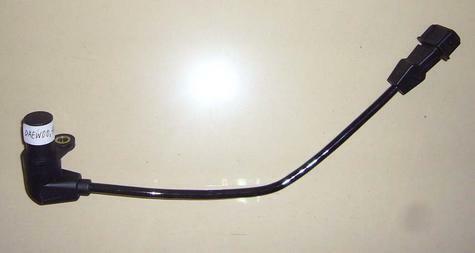 The typical TPS will have a high resistance at closed throttle, that will steadily decrease as the throttle is opened. The signal produced by the TPS will be low voltage output at idle and a voltage output that reaches maximum reference voltage at full throttle, near 4.5 volts. By monitoring changes in the TPS signal voltage, the control module is able to determine throttle angle and calculate fuel delivery accordingly. 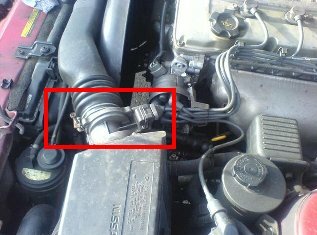 Auto repair jobs involving the troubleshooting of a fast idle condition should look at the throttle position sensor as the culprit. The Manifold Absolute Pressure Sensor (MAP) supplies engine load information to the engine control module. The engine control module uses this information to calculate fuel delivery. In addition, some engine control systems will use MAP sensor information to calculate spark timing. Intake manifold vacuum varies with engine speed and load. When the vehicle is at idle or decelerating, intake manifold vacuum is high. When the engine is accelerating or under a heavy load, intake manifold vacuum drops. Intake manifold vacuum is a direct indicator of the amount of load placed upon an engine. The MAP sensor sends a voltage signal or frequency (some vehicles), to the control module that corresponds with the level of vacuum present in the intake manifold. The Engine Coolant Temperature Sensor (ECT) is used by the on-board computer system to determine engine temperature. The on-board computer uses this information to calculate proper fuel delivery and ignition timing. On some vehicles, this information is used by the on-board computer to activate certain emission control systems or to engage the engine cooling fan. The ECT is a thermistor. The electrical resistance of the sensor decreases as the temperature increases. The ECT sensor is screwed into the side of the engine where it is exposed to the engines coolant. The on-board computer sends a reference voltage to the sensor, usually 5 volts. As the engine heats up the resistance accross the sensor decreases. The computer then determines the temperature of the vehicle by reading the voltage accross the sensor. The voltage across the sensor can range from 4 volts when the engine is cold to less than .5 volts when the engine has reached operating temperature. The mass air flow sensor is located between the air cleaner and the throttle body. It is used by the control module to measure the volume of air entering the engine. The control module uses this information to calculate fuel delivery. The typical MAF sensor contains a mesh screen to break up air flow and prevent debris from entering the sensor. A thermal element is placed in the air stream and is heated to a specified temperature by the flow of electrical current. Air flowing through the sensor reduces the temperature of the thermal element, causing current flow through the element to increase to maintain temperature. Air flow is calculated by monitoring the amount of current required to maintain the thermal element at the specified temperature. Refer to an OBD-II table when involved in an auto repair job after the check engine light has come on and you have retrieved the trouble code. The crankshaft position is used by the control module to calculate engine speed and cylinder position. The control module uses this information for fuel delivery and ignition control. The typical CKP sensor is a signal generator that produces an AC voltage signal based on engine speed. 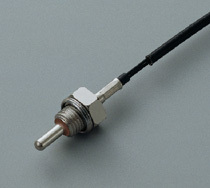 The CKP sensor is placed in close relation to a toothed wheel, mounted on the crankshaft. The toothed wheel is either cast into the crankshaft or mounted at the front or rear of the crankshaft. When the toothed wheel is rotated past the CKP sensor, an AC voltage is generated by the sensor. Gaps strategically placed in the toothed wheel correspond with the cylinder position of the engine. The control module picks up the gaps as a momentary change in CKP sensor output and is able to calculate cylinder position accordingly. The camshaft position sensor is used by the control module to determine the position of the number one cylinder. This information is most commonly used by the control module as a reference point to begin sequential fuel injection operation. Sensor type and locations can vary widely from model to model. The most common types are magnetic signal generators and hall effect switches. Sensors can be mounted in the distributor or in the timing cover, facing the camshaft gear. 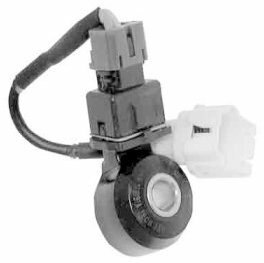 The knock sensor is used by the control module to monitor engine detonation or spark knock. The control module uses information from the knock sensor to adjust ignition timing, to decrease detonation in the engine. The knock sensor can be found at various locations on the engine block or cylinder head(s). Some systems use two knock sensors for more efficient spark control. The knock sensor is a piezo-electric device that generates a voltage signal when vibrated. 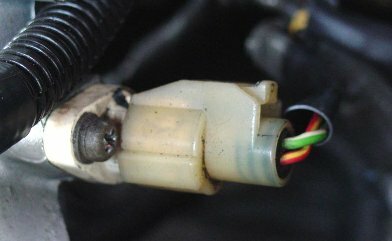 The pulses generated by engine detonation are converted by the knock sensor, into a voltage signal that the control module uses to detect spark knock. The control module retards the ignition timing a predetermined amount, until spark knock is no longer detected. 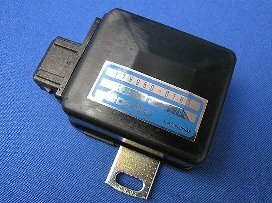 Of course, this sensor is one of the first things you should check when encountering engine knock (before heading for your local auto repair shop). The oxygen sensor produces a voltage signal based on the amount of oxygen in the exhaust of the engine. This voltage signal is used by the control module, to provide air/ fuel mixture information for fuel delivery and emission control. The oxygen sensor is placed in the exhaust stream of the engine. When heated, it acts like a small battery to produce a voltage signal based on the ratio of oxygen in the exhaust system and reference air contained inside the sensor or sampled from the atmosphere. 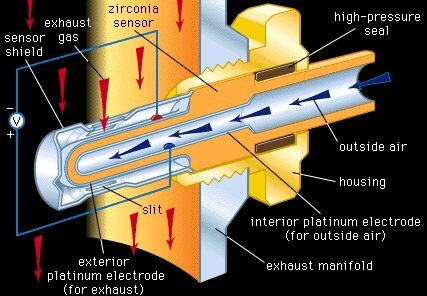 A high exhaust oxygen content would indicate lean exhaust and result in low voltage output from the oxygen sensor. Low oxygen content indicates a rich exhaust and would result in a high voltage output from the sensor. The control module monitors this voltage output to constantly tailor fuel delivery to maintain a precise air/fuel ratio of 14.7-1. This ratio is needed for efficient operation of the catalytic converter. A properly working oxygen sensor will produce a varying voltage signal from below 200mv to above 800mv, as the fuel system works to maintain air/fuel ratio. The average voltage reading from the oxygen sensor should be around 450mv. Oxygen sensor response time from rich to lean, should be less than 100 milli-seconds. An improperly working sensor can affect engine performance and emission levels. A false, low voltage output from the sensor, can result in excess fuel being delivered to the engine and affect fuel mileage, driveability and vehicle emissions. Severe cases can cause catalytic converter damage from excess fuel in the exhaust system. An oxygen sensor with slow response time can affect emissions and fuel economy as well. Oxygen sensors can be contaminated by silicone, causing a high but false voltage signal and resulting in poor engine performance from improper fuel delivery. Countless big ticket auto repair jobs related to engine performance can be avoided by simply inspecting this sensor and replacing if necessary. The intake air temperature sensor is a thermistor that is used to input air temperature information to the control module. The control module uses this information to control fuel delivery by calculating the density of incoming air using temperature. The intake air temperature sensor responds to temperature changes by decreasing resistance as temperature increases. The control module sends reference voltage through the sensor and calculates the air temperature by monitoring the signal that returns. Since resistance is high at cold temperatures, signal return voltage will be low. As the temperature increases, sensor resistance decreases and signal return voltage will increase. The EGR position sensor sends information relating to EGR flow to the control module. This information is used either to adjust fuel delivery to compensate for EGR operation (on some models) or to verify proper EGR function for diagnostic and troubleshooting purposes. The EGR position sensor is a variable resistor that outputs a voltage signal that corresponds to the relative position of the EGR valve. The control module supplies a reference signal to the EGR position sensor and monitors return voltage to calculate EGR operation. Failure of the EGR valve to respond to the desired position, can result in a failed diagnostic and illumination of the MIL by the control module. Check this sensor before visiting your local auto repair shop. 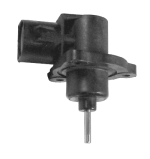 The EGR temperature sensor is a thermistor that is used by the control module to verify EGR flow. The information from this sensor is used to provide diagnostic and troubleshooting information to the control module for the EGR valve. The EGR temperature sensor is placed in the exhaust stream at or near the EGR valve. 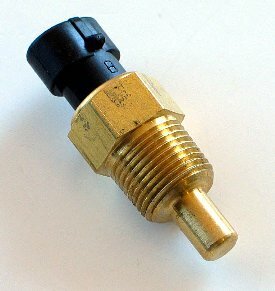 When the valve is commanded on, exhaust will flow past the sensor, increasing the temperature of the sensor. The increased temperature of the sensor will result in lower sensor resistance and cause a voltage output of the control module to be pulled to ground. 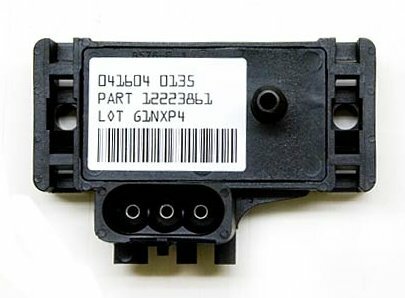 The control module is able to determine proper operation of the sensor by looking for the voltage level of this signal to drop when EGR is commanded on. 10 Comments on "Automotive Sensors"
what is EGR stands for. 1995 siverado, 350, 5 spd…..one 02 sensor….would that really cause a glitch at about 3800/4000 rpm if it was questionable ? and would I be a ble to read 450Mv approx. 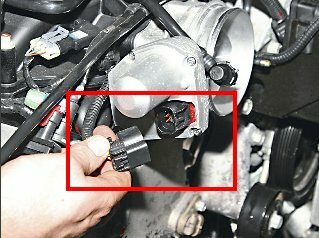 at idle for a good 02 sensor ? been chasing this for a while….thanks. Jaguar alarm , XK8 1997, changed battery, put code for radio in , everything else is working, have to use key for door and boot fob not actovating, is there something else , worked before changed battery, any ideas?